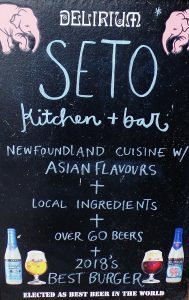 Situated at 281 Duckworth Street at the end of a row of buildings – that stand out only because of their wide, decorative window facings – is Seto Kitchen + Bar. Inside, a suite of rooms, most likely occupied years ago by a law firm, have been organized into a small restaurant. Smaller still is the bar and kitchen, a kind of L shaped alley or ginnel that separates Seto’s two dining rooms. The rooms are comfortable and unfussy. I like sitting in the front room off Duckworth Street because the bar is open on that side. 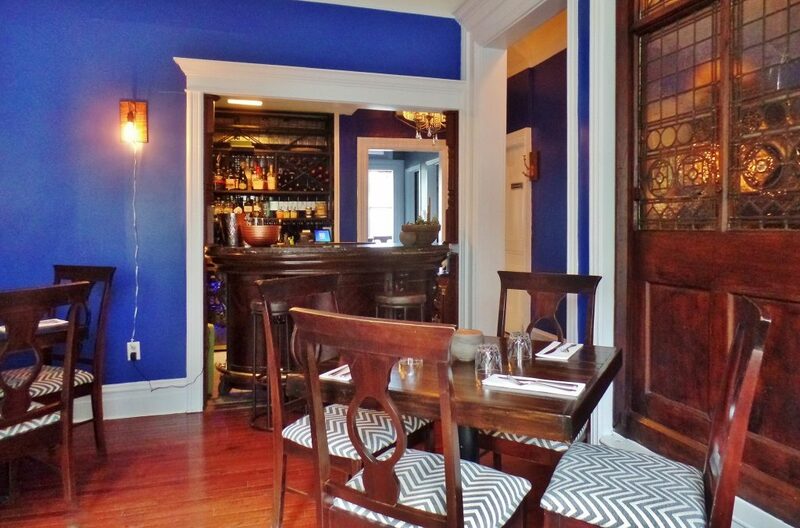 It gives me a good view of the bar and of the general back and forth between kitchen, bar and dining rooms. Featuring a 1940s photo of chef Ken Pittman’s grandfather, William Seto Ping – looking very dapper, seated on a Breuer designed Bauhaus chair – Seto’s one-page menu was short enough to suggest that, in capable hands, everything would be fresh and focused. A special tasting menu was also available. 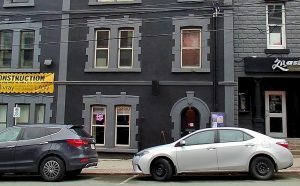 Outside, the restaurant’s sidewalk sign promoted “Asian flavours with local ingredients.” Doing local ingredients in March is a challenge, but things are getting better as dedicated restaurateurs, chefs and producers work to keep a supply going. Greenhouse technology, better storage, better freezing and old-fashioned canning have made a difference. Asia is known for spice markets and flavour-rich ingredients. In art, painters use paints differently. How would chef Pittman use his Asian spices? Would he be nuanced? Or, would he go bold? Seto’s simply named, “roasted chickpeas,” showed a deft hand. The versatile chickpea, main ingredient, was joined by salt roasted shallot, roasted carrot and kale. A green curry sauce, underneath, delicately permeated the dish. Green chilies, sweet coconut, garlic, citrus and other flavours came, harmoniously, to the fore and then, like a fade in a movie, slowly receded as waves of heat from the chilies finally took effect. I liked how things were starting. 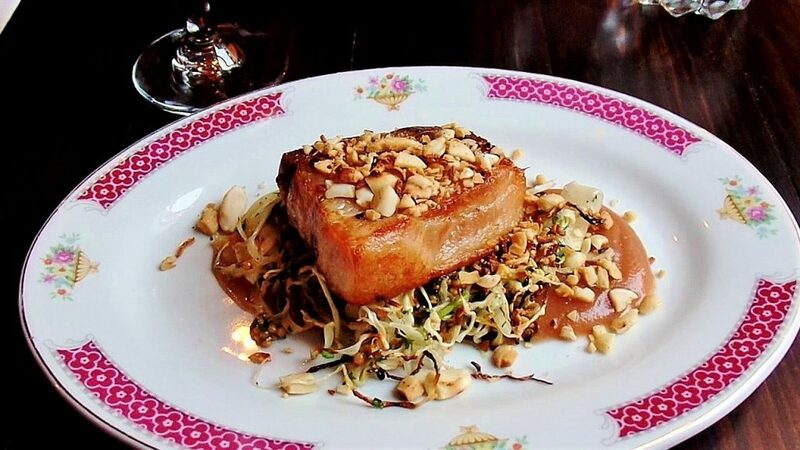 A nice sized piece of unctuous, pork belly, which chef Pittman had lightly cured and cooked by sous vide, was helped along just enough by the complementary earthiness of coal roasted cabbage, the fruity tang of miso tinged apple butter, and a biting full-on mustard seed sauce. Seasoning came from an invention Ken Pittman calls. “dukkahrashi,” an Egyptian-Japanese marriage of sorts. Dukkah is an Egyptian spice blend with hazelnuts, coriander, cumin, sesame and pepper, and togarashi is a Japanese seven-spice blend. Seto put them together for dukkahrashi. The pork – the best flavoured pork I’ve had in ages – needed little more. It’s easy to forget how good farm raised pork can be. Chef Pittman told me the locally farmed animal was a cross of the Berkshire and another variety. 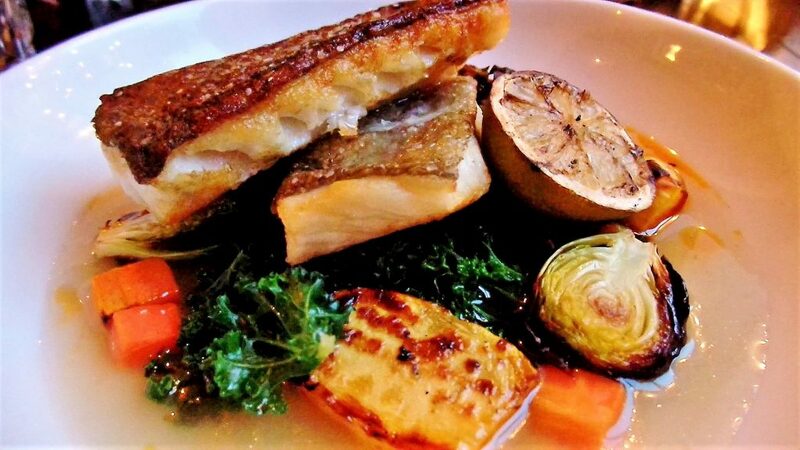 Skin-on cod with vegetables and “Big Ken’s bacon dashi,” was another happy memory. Dashi is broth flavoured with kelp and bonito flakes. Chef David Chang, of Momofuku fame, came up with the idea to replace the bonito flakes with smoky bacon. Perhaps chef Pittman’s dashi is an homage. Anyway, the crispy skinned cod cutlets were delicious, as were the hibachi grilled vegetables: carrots, brussels sprouts and turnip. The dashi was the clever extra that gave the dish unity. 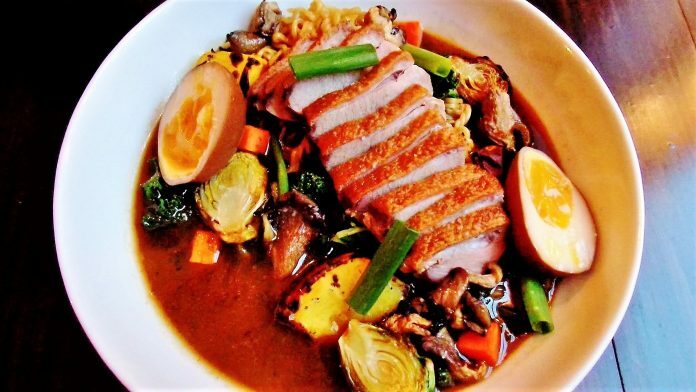 Seto’s crispy skin duck breast presented a striking visual as it appeared, almost, to hover over a bowl of ramen, winter greens and seasonal vegetables in dark, rich, chicken broth. The freshly cut halves of a soy marinated egg – stained evenly brown – revealing runny, bright yellow yoke, added extra eye appeal. Ken Pittman’s duck preparation was excellent. It was a dish for winter dining, filled with strong, familiar flavours: from mushrooms and roots to cruciferous winter sprouts. It’s wonderful how summer can be captured in a mason jar. We were lucky enough to order some of the last of Seto’s preserved Ontario peaches from last summer’s crop. Preserved in their own juice with sugar and water, their flavour had become concentrated, and different, but in the best kind of way. It served as a reminder that summer’s not that far off. The trend in restaurant food these days is, more is better. More of everything! I’m not against more ingredients, but they must be there for sound reasons, otherwise you run the risk of a plate turning into the culinary equivalent of a junk drawer. The best chefs are thinkers; I mean the ones who carefully consider what impact adding or amplifying or subtracting something will have on the taste of a dish. Ken Pittman is such a chef. He knows what works and what doesn’t. I see it in everything that comes out of Seto’s kitchen. Open Wednesday to Saturday: 5:30 p.m. to 10 p.m. Sunday: 6 p.m. to 10 p.m. Monday and Tuesday: Closed. Beverages Seto’s bar has nearly 20 cocktails and a few non-alcoholic drinks. Some of Seto’s cocktails offer a new take on classics. The Cola Old Fashioned, for example, is made with Buffalo Trace Bourbon, cola bitters and an orange twist. The Toki Electric, “inspired by the Electric Daisy,” is made with Toki Suntory Whiskey instead of rum. While Seto’s wine list is not extensive it has something to pair effectively with everything on the menu. Whites are dominated by the Old World; reds are mostly new. If you’re in doubt about what to have, there’s always champagne. A tasty bottle of Benjamin Bridge from Nova Scotia costs $60. Seto has an impressive beer list including ales of various strengths, colours and flavours from around the world, stouts and porters, lagers and pilsners, ciders, seasonal and specialty brews. Two international brewers are favoured with their own sections, Evil Twin Brewing Company of Denmark, and Brewery de Bravandere of Bavikhove, Belgium. Brewery de Bravandere selections include: Petrus Aged Red, Petrus Dubbel, Petrus Rood Bruin and Wittekerke Rosé. A solid selection of spirits is dominated by bourbon, scotch and Irish whiskey. A shot of 21-year-old Highland Park Scotch will set you back $26. Best bets Pork belly, cod and duck breast. Gluten free options Yes, and accommodations can be made. Vegetarian and vegan options Roasted chickpeas.